1961 10/- Coombs/Wilson Reserve Bank QEII consecutive run of 4 banknotes aUnc. Serial No AH45 563501 - AH45 563504. McDonald 25. Catalogue Value $1,100.00. 1961 10/- Coombs/Wilson Reserve Bank QEII and 1961 £1 Coombs/Wilson Reserve Bank QEII with Emerald Green reverse banknotes aUnc. McDonald 25 and 52. Catalogue Value $470.00. 1927 £1 KGV Riddle/Heathershaw banknote gF. No tears. Also 1941 £5 Armitage/Mcfarlane KGVI banknote with minute pinholes and small tear. McDonald 41 and 68. 1961 £1 Coombs/Wilson Reserve Bank QEII consecutive run of 4 banknotes with Emerald Green reverse Unc. Serial Nos HK40 5551786 - HK40 5551789. McDonald 25. Catalogue Value $1,300.00. 1976 $1.00 Knight/Wheeler Centre Thread F, 1976 $1.00 Knight/Wheeler Side Thread EF (3), 1979 $1.00 Knight/Stone EF (4) and Unc (1), 1982 $1.00 Johnston/Stone aUnc, 1976 $2.00 Knight/Wheeler Side Thread EF, 1979 $2.00 Knight/Stone Unc, 1985 $5.00 Johnston/Fraser OCR-B aUnc, 1993 $5.00 Fraser/Cole polymer Unc, 1995 $5.00 Fraser/Evans Wide Band polymer Unc, 2001 $5.00 Federation Unc (3), 1972 $10.00 Commonwealth of Australia Phillips/Wheeler VF, 1988 $10.00 First Print Bicentenary Unc, 1988 $10.00 Bicentenary folder, 1993 $10.00 Fraser/Evans Polymer Unc, 1966 $20.00 Coombs/Wilson good EF (2) and 1972 $20.00 Commonwealth of Australia Phillips/Wheeler F. Catalogue Value $742.00. Also 1988 Bicentennial Coin and Note collection containing $2.00, $5.00 and $10.00 coins, $2.00 and $5.00 Paper notes and $10.00 Polymer note in presentation folder, with a few marks on cover. Serial number QAH 008140. 1982 $1.00 Johnston/Stone bundle of 50 banknotes with consecutive numbers Unc. Serial Nos DLE 410510 - DLE 410560 excluding 410519. A few outer notes at either side of the bundle are aUnc. 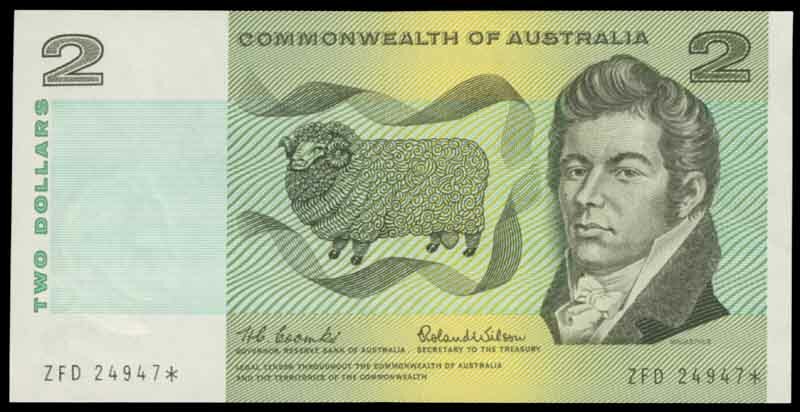 1966 $2.00 Coombs/Wilson Commonwealth of Australia Star replacement banknote consecutive pair aUnc. Nice crisp flat notes, with just slight teller flicks. Serial nos ZFD 24946* and ZFD 24947*. McDonald 121s. 1985 $2.00 Johnston/Fraser bundle of 100 banknotes with consecutive numbers Unc. Serial Nos LLC 807706 - LLC 807806. Includes radar note LLC 807708. 1988 Bicentennial Coin and Note collection containing $2.00, $5.00 and $10.00 coins, $2.00 and $5.00 Paper notes and $10.00 Polymer note in presentation folder. Serial number QAH 008612. 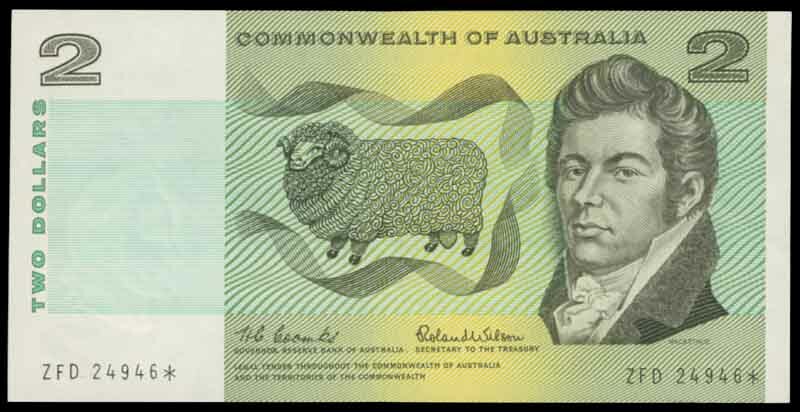 1996 30 Years of Decimal Currency Black serial numbered portfolio's containing $5.00 polymer note and 45¢ QEII Birthday gutter strip of 10. Serial No QE 96 002825. McDonald N/A PT12. 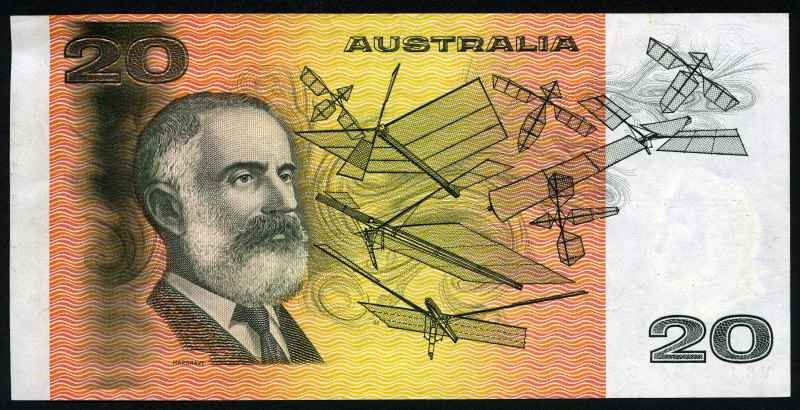 1985 $20.00 Johnston/Fraser OCR-B serial number with black vertical inking flaw at left of Hargraves, from the roller EF. McDonald 409a.